Chile is a land of incredible contrasts, from the dry Atacama desert in the north, the the ice, snow and glacial lakes of the south. It is the longest and thinnest country in the world, measuring over 4300km (2700 miles) from north to south and only 240km (150 miles) from east to west. Chile is also famous for the incredible Torres del Paine, considered by many to be the finest nature travel destination in South America. 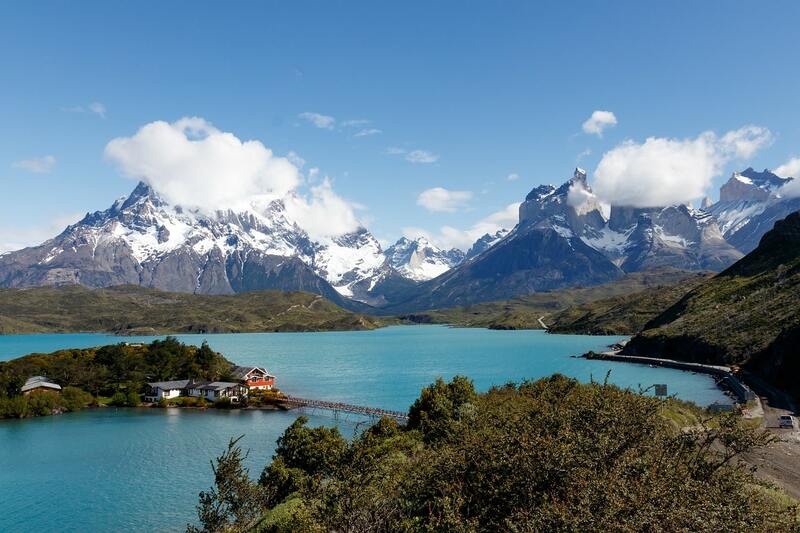 Torres del Paine National Park comprising mountains, glaciers, lakes and rivers. The landscape of the park is dominated by the Paine massif, which is an eastern spur of the Andes located on the east side of the Grey Glacier, rising dramatically above the Patagonian steppe. Small valleys separate the spectacular granite spires and mountains of the massif. After breakfast, a city tour of Santiago. An excursion to the Cerro San Cristobal viewpoint for a beautiful panoramic view of the city. Today a visit via the Maipo Canyon and up to Las Vertientes, a popular resort at the foothills of the Andes, with a view of the winding Maipo River. We continue to the Aquitania winery. Designed by the famous Chilean architect Martin Hurtado and built in 1998 the winery Almaviva was inaugurated in 2000. Today this first class winery is recognized for its perfect integration of both aesthetic design and functionality using symbols and artifacts of the Mapuche culture, the native people of Central and Southern Chile. While visiting the winery, its vineyards as well as the wine cellars we will learn about the wine making process and enjoy a wine tasting. After breakfast, transfer to the airport for the flight to Calama, in the north of Chile. Arrival and transfer to San Pedro de Atacama, set in the middle of the Atacama Desert. In the afternoon we will take in the eerily silent moonscape of Valle de la Luna, with its backdrop of snow-capped volcanoes. We will see this during sunset, and then return to the hotel. After breakfast we visit San Pedro de Atacama. Many years ago it was the centre of a Paleolithic civilization that built impressive rock fortresses on the steep mountains encircling the green valley. Its colonial church was constructed in 1577. The village is the centre of the native culture of Atacama, where mummies and artifacts have been dug up. You can view them in the unique Father Le Paige Museum. Over 4.000 skulls, innumerable mummies, weapons, stone tools and pottery are on display. After visiting the museum we have time to visit Tulor, which is the oldest evidence of human life in the valley. Lunch before we start towards Toconao, a village where the local people are devoted to the manufacture of white volcanic stone sculptures. We proceed to the huge Atacama Salt Lake, an inland sea formed millions of years ago. It&apos;s a unique experience to view the vast plain of the octagonal shaped salt crusts in the middle of the driest desert on Earth. The flat emptiness here is overwhelming. We will observe this prolonged sunset, and then return to the hotel. Today we depart at 4:00 am in order to take advantage of a visit to El Tatio Geysers, a geothermal field flanked by soaring peaks. At dawn, powerful spurts of steam shoot out from various blowholes. The steaming ponds are encrusted with brilliant salt crystals which reflect the metal-blue sky at dawn. By the rising columns of steam, they make for a breathtaking sight. After seeing this wonder of nature, we proceed to visit a charming highland village. In Machuca the ancient llama caravans used to rest from their travels along the &apos;Inca Highway&apos;s. Free afternoon. After breakfast, a transfer takes you to board your departure flight. After arriving in Puerto Montt; Transfer to your hotel in Puerto Varas. Half day Tour to Frutillar. Trip along Llanquihue Lake, the second largest lake in Chile, with gorgeous views of the volcanoes Osorno, Calbuco, Puntiagudo and Tronador. Pick-up at your hotel in Puerto Varas or Puerto Montt to travel to Frutillar, a charming village on the bank of the huge Llanquihue Lake The village is noted for the German influence on the architecture developed by the immigrants who arrived around 1853. Here we will take a walk to visit some restored colonial houses and see the strong German influence on the architecture. You will learn about the history of this picturesque town and about the time of German settlement. Afterwards we will visit the open-air German museum. In the afternoon return to your hotel Puerto Varas. After breakfast, transfer to Petrohue which is the starting point of the fabulous Vincente Perez Rosales National Park. Board the catamaran for the wonderful All Saints Lake crossing (Lago Todos Los Santos) (1.5 hours), our destination being Peulla, located within Vincente Perez Rosales National Park itself. Accommodation at the Peulla Hotel. A choice of tour options. After breakfast, we leave this beautiful National Reserve to continue our journey first by bus to the Chilean-Argentinean border where we must complete custom formalities. Once in Argentina, we then board another boat for the short ride across Lago Frias with wonderful views of spectacular waterfalls and Mount Tronador in the background. Arrival to Bariloche and transfer to our hotel. Free day of leisure to enjoy the beautiful surroundings of Bariloche. Enjoy the most deluxe ski resort in South America or simply wander around the shops. Take a cable car ride for tremendous views of the area or for the more adventurous, choose from mountain biking and horse riding to fly fishing. After breakfast, we shall take a different route back to Chile driving around the beautiful Nahuel Huapi Lake and heading towards the delightful town of Villa La Angostura (trip with public bus). Along the journey we shall pass other lakes including the Espejo or Mirror Lake which is one of the 7 lakes of the famous 7 Lakes route of Argentina. We cross the Argentinean - Chilean border over the Andes pass and head south back to Puerto Varas. Transfer to your hotel.